Photo Left: GM salmon are currently confined to labs. "The least fit individual in the population is getting all the matings - this is the reverse of Darwin's model"
"It would make it very difficult for anyone at the moment to approve the release of GM fish carrying growth hormone"
According to new research published in the Proceedings of the National Academy of Sciences of the United States of America, a single genetically modified (GM) fish released into the wild could turn Darwinian evolution upside down and wipe out local populations of the species. The paper, by William Muir and Richard Howard of Purdue University in West Lafayette, USA, made the discovery while modelling ecological risks associated with genetically modified organisms (GMOs). The researchers have dubbed their idea the ‘Trojan gene’ hypothesis. The researchers studied fish carrying the human growth hormone gene, hGH, which increases growth rate and final size. Muir and Howard produced transgenic Japanese medaka (Oryzias latipes), carrying the growth hormone gene. 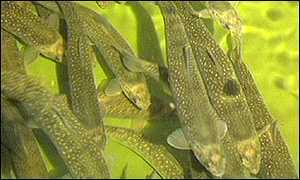 The transgenic fish became sexually mature faster than normal fish and produced more eggs. Other experiments using non-modified fish revealed that larger males attracted four times as many mates as their smaller rivals. This effect has also been observed in salmon, a commercial candidate for gene transfer technology. According to Muir, larger, transgenic fish would enjoy the same reproductive advantages and the hGH gene would quickly spread through a fish population. Muir and Howard also found that only two-thirds of the transgenic medaka survived to reproductive age compared with wild medakas. Thus, the spread of the growth hormone gene through the population could cause them to fall and eventually become extinct. In order to determine the magnitude of this effect, a computer model was used to predict population changes. By adding 60 transgenic individuals to a wild population of 60,000 fish, the model predicted that the population would become extinct within only 40 generations. The same effect could be observed when only one transgenic animal was added to the population, the extinction effect just took longer. Commenting on the research, Muir said, "You have the very strange situation where the least fit individual in the population is getting all the matings, this is the reverse of Darwin's model. The sexual selection drives the gene into the population and the reduced viability drives the population to extinction." According to the researchers, their results are the first evidence that GMOs could have catastrophic consequences on their own species. Other experts, such as David Penman, a fish geneticist at the University of Stirling, UK, welcomed the discovery. 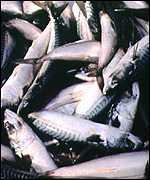 Penman has evidence that some transgenic fish modified with growth hormone have reduced sperm production and mating success. "If large males tend to mate with large females, this would often result in matings between transgenics," he commented. This effect would decrease rather than increase the spread of the gene. John Beringer of Bristol University, a former chairman of the British committee that advises the government on GMOs, commented that the research was a warning. He is cited as saying, "It would make it very difficult for anyone at the moment to approve the release of GM fish carrying growth hormone…..I would have to give a great deal of consideration about whether that's an intelligent route to go down." The paper explaining the ‘Trojan Horse’ hypothesis appeared in PNAS (1999) 96(24), pp. 13853-13856 and was by William M. Muir and Richard D. Howard.